Another great night in the office over the weekend at the Victorian Amateur Martial Arts Association V.A.M.A.A Muay Thai event held in Parkville Friday the 15th of June. Wayne Sor. 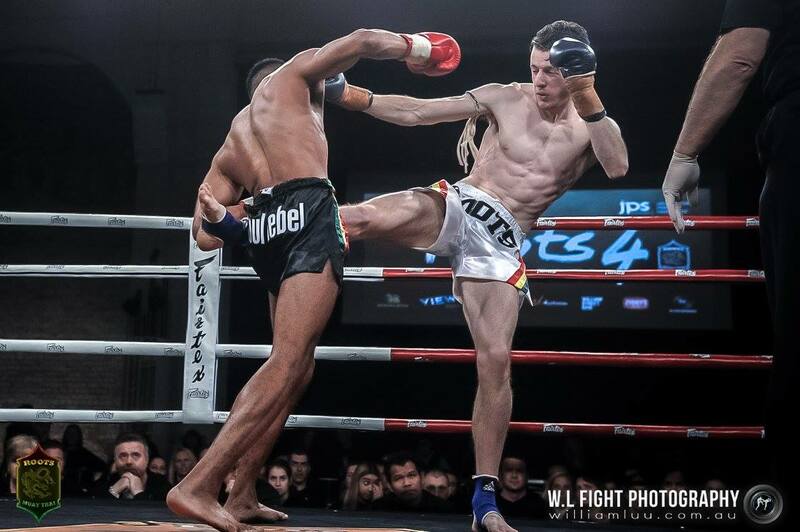 Nak Dee pulled off another great win with some slick, calculated and stylish kick fighting against a combo fighter. 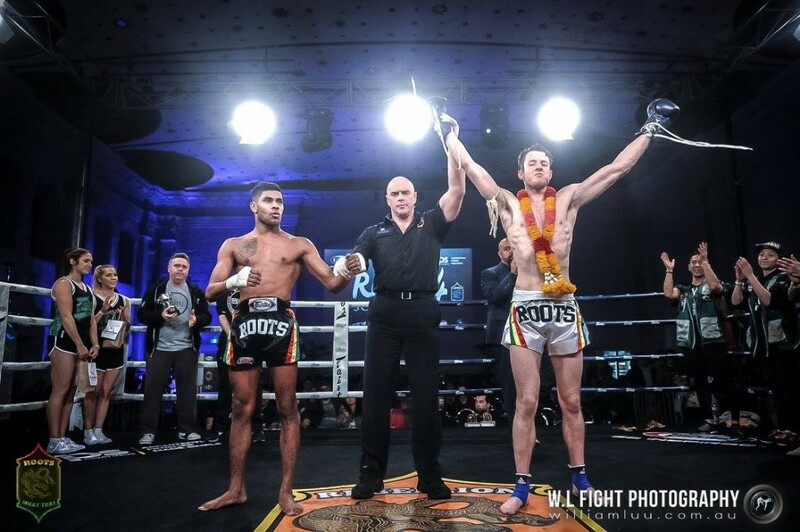 The Dynamite Muay Thai fighter was initially on as fight number 8 on the night but due to two pullouts at the weigh-ins there was a shuffling off opponents. For the sake of having a fight after having Wayne’s opponent pulling out meant that the Dynamite Muay Thai fighter had to take on the K1 Kickboxing fight. “Rules change, opponents change, but the game plan, the game plan doesn’t” Kru Dennis on his thoughts of the late change. “Even without all the usual arsenal of weapons, it changes nothing for Wayne, he is well prepared, he is ready!” Kru Dennis as he tells his fighter and his seconds preparing Wayne on the night of the fight. Truth be told, Wayne was more than ready, playing with some newly revised technical fight game play over a heavy hitting combo striker. Dynamite Muay Thai fighter Freddy Sor. 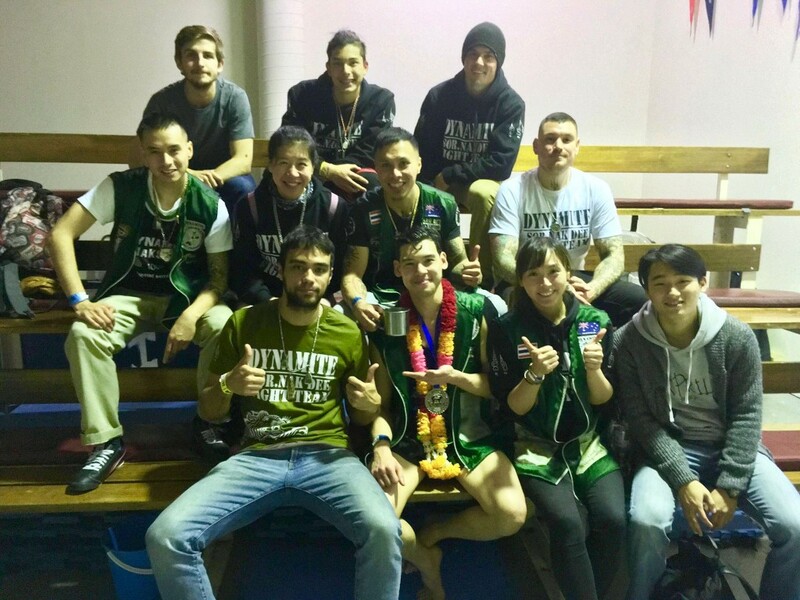 Nak Dee (Pictured in the Army green coloured Dynamite uniform) unfortunately was unable to get a match up though he will be back in the ring for the next V.A.M.A.A fights once again scheduled in late July. 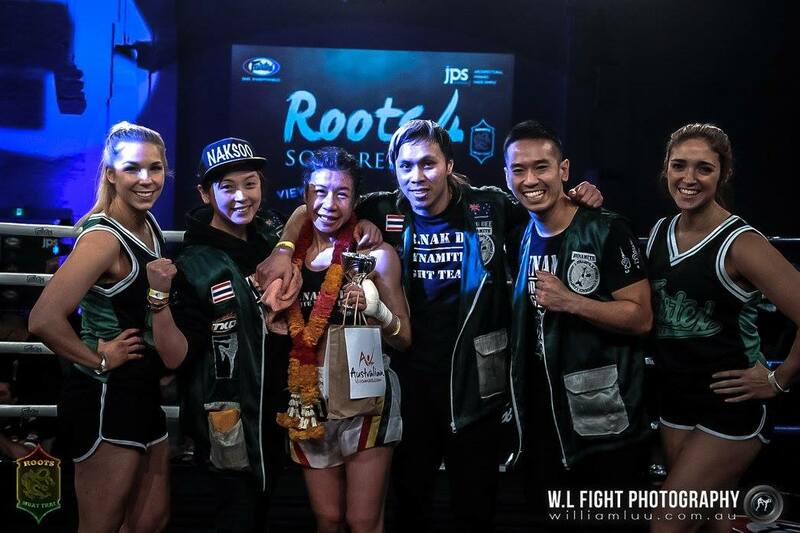 The beautiful warm air and warmhearted smiles greet us every year as Dynamite Muay Thai and Sor. 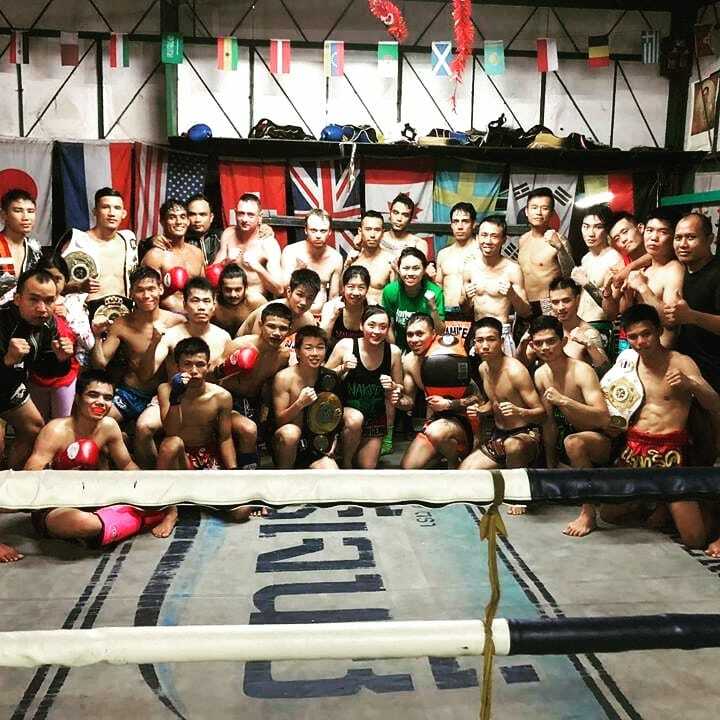 Nak Dee fighters converge on the motherland of Muay Thai for the annual Dynamite Thai Trip. Each year around the time of Songkran (Thai water festival in April) and May, the Sor. Nak Dee Fight family of Dynamite Muay Thai set off to travel and train in Thailand. The first 4 day stop for the first half of the team is Phuket. Not for partying and getting loose but some acclimatisation and relax from the heavy office life schedule mixed in with the rigorous fight calendar schedule. For the team just being away from daily life is already less distraction and more time to concentrate on training. Then by day 5, business as usual with minimum of two sessions per day with runs in the morning and afternoon scheduled and free time or tour time in hours between training. First stop Numponthep Muay Thai for that traditional, authentic Thai gym stadium style fight preparation. 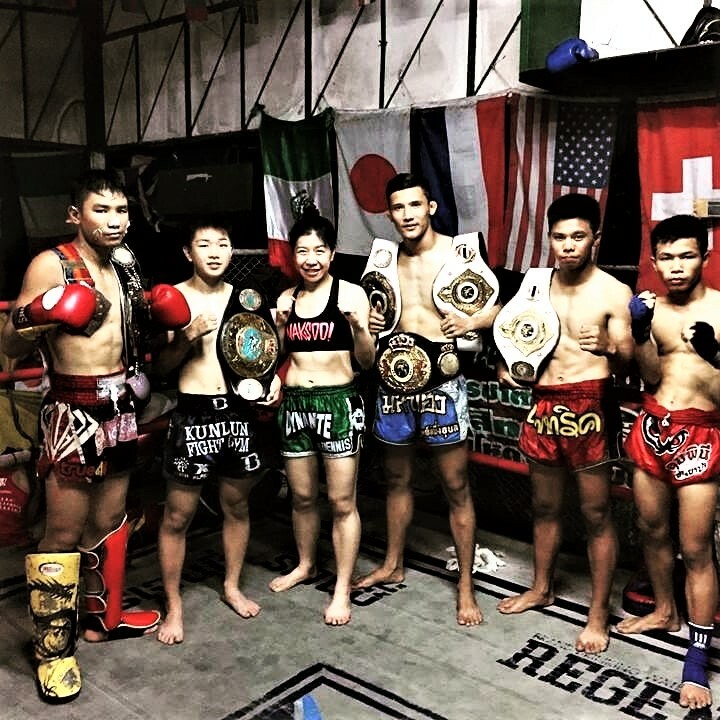 The 2018 Dynamite Muay Thai Sor. Nak Dee fight family trip was a great way to be able to catch up with Dynamite fighters from Malaysia and Hong Kong whilst in Thailand. 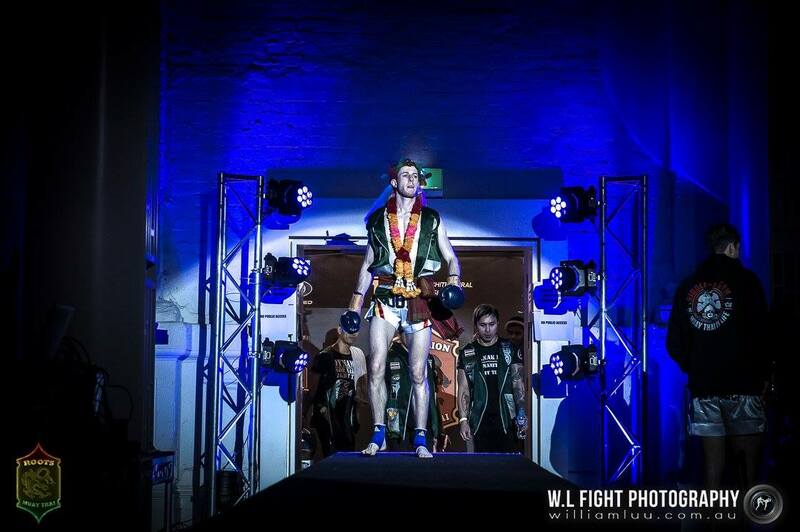 Dynamite Muay Thai Sor. Nak Dee fighter Zia Seua Sor. Nak Dee in a photo with Silatong before everyone decided to jump in. Dynamite Muay Thai’s Sor. 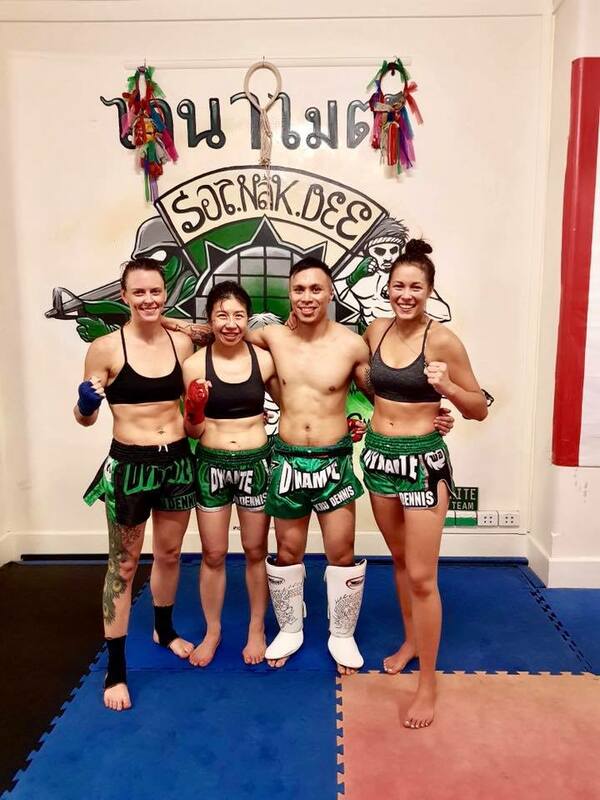 Nak Dee female fighters pose for a quick photo after hard sparring rounds at Dynamite Muay Thai Melbourne HQ. All three fighters will step up to fight their respective internatinal repesentative counterparts on Saturday the 14th of April at the historic Meat Market venue 5 Blackwood Street, North Melbourne. Dynamite Muay Thai’s Zia ‘Seua Thong’ Sor. Nak Dee will be captaining the team after the recent Oceanic title fight win. “She is feeling confident of the responsebilities of taking charge and leading the team to show them how it’s done.” Head Coach, Kru Dennis. Zia will be fighting a seasoned Mixed Martial Arts fighter from the renown American MMA training camp Jackson Wink MMA. Selena Sor. Nak Dee and Natalie ‘Yingpetch’ Sor. Nak Dee will be facing hard hitting rising stars from Hong Kong’s Youth Union Gym who always bring a steady flow of serious female figters to Dynamite NAKSOO Female FIght Series. 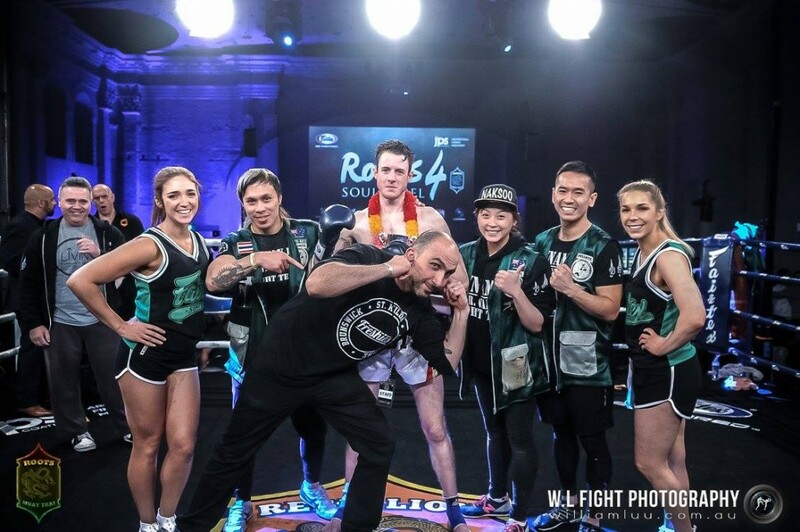 Melbourne CBD based Dynamite Muay Thai gets 4 for 4 wins over the weekend with third fighter of the day Jimmy “The After Party” Sor. Nak Dee securing the third convincing victory for Dynamite with a unanimous win over a tough opponent Rishi from another well reputed Muay Thai gym, this time being Ballarat. Dynamite Muay Thai Fighter Jimmy fought a well prepared opponent who came in hard without a feeling out period looking for a quick knock out. Jimmy managed to drop his opponent twice in the first round. One in the first 30 seconds of the opening round with a huge cross to the face but unfortunately the referee didn’t give his opponent a count rather instructing him to get back on his feet and brush off his gloves and the second knock down was about a minute in with a barrage of combos to Rishi’s face. 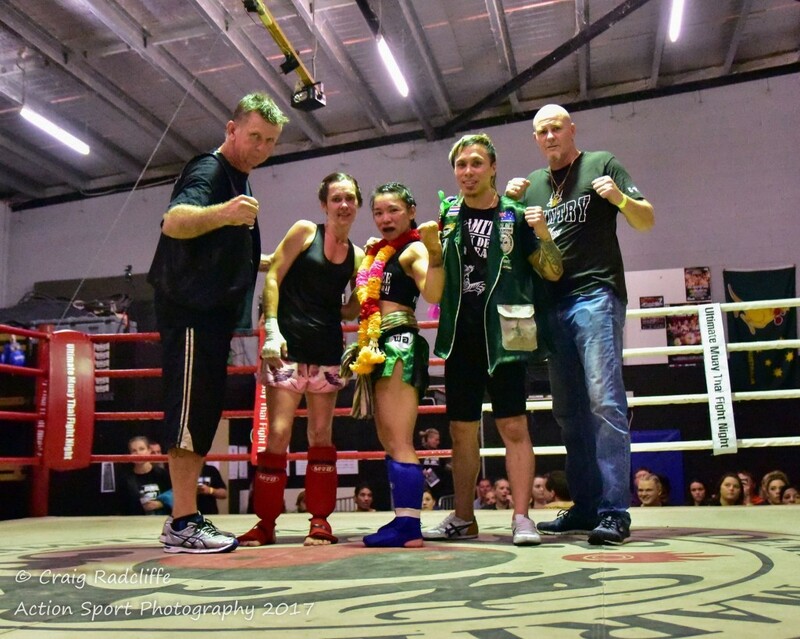 Melbourne CBD based Dynamite Muay Thai gets 4 for 4 wins over the weekend firstly with female fighter Zia Seua Sor. 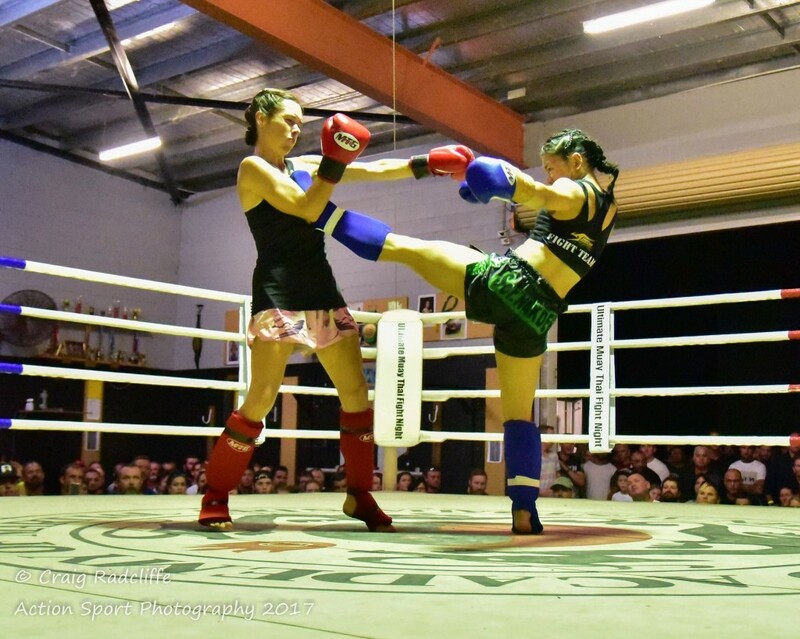 Nak Dee securing a strong, convincing victory with a majority points win over a tough opponent Shenae from well reputed Western Australian Muay Thai gym. 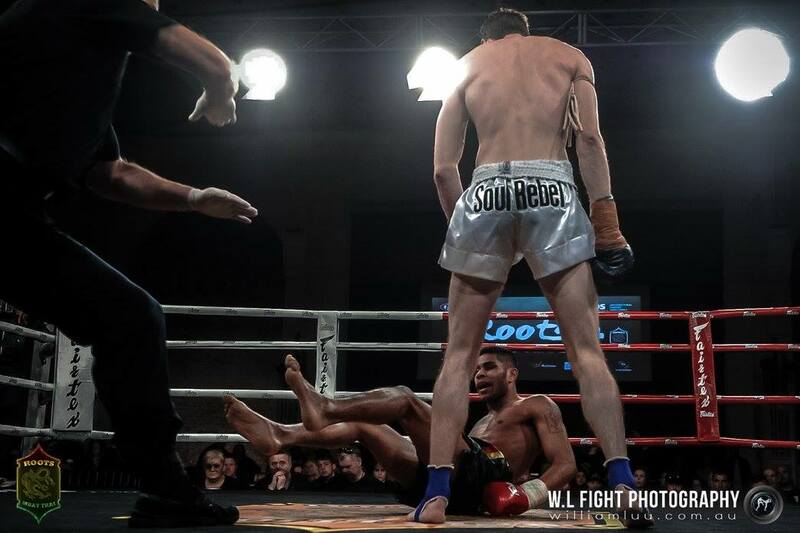 The opening seconds of fight 10 of the Rebellion Roots Muay Thai Fight went off with a bang! 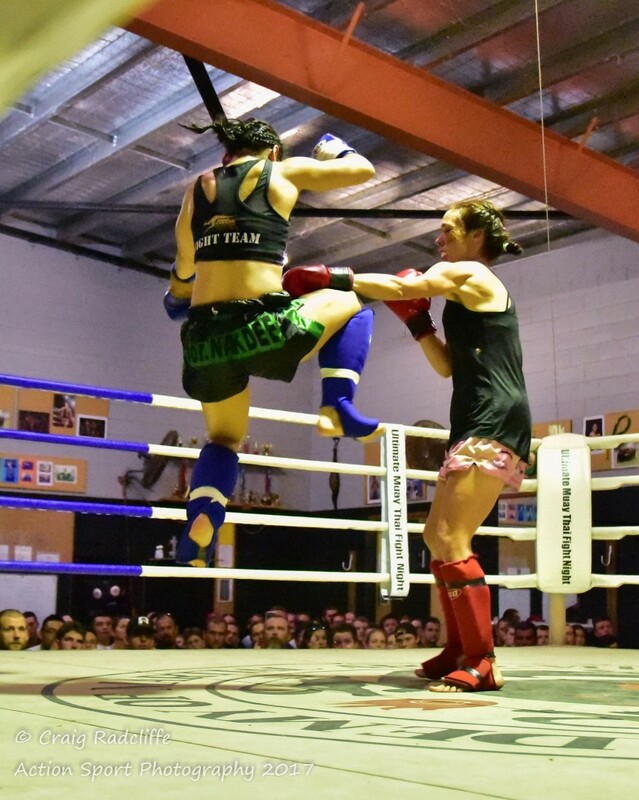 within 5 seconds of the first exchange between Zia and Shenae the Dynamite fighter managed to dump her opponent heavily into the canvass with her legs flying in the air and a massive thump which was her opponents head. The fight was a high work rate all rounder, action packed with brutal exchanges of elbows in and out of the clinch, a barrage of sweeps, dumps and knees with a total of 8 dumps recorded against Zia’s opponent in round 2 alone. 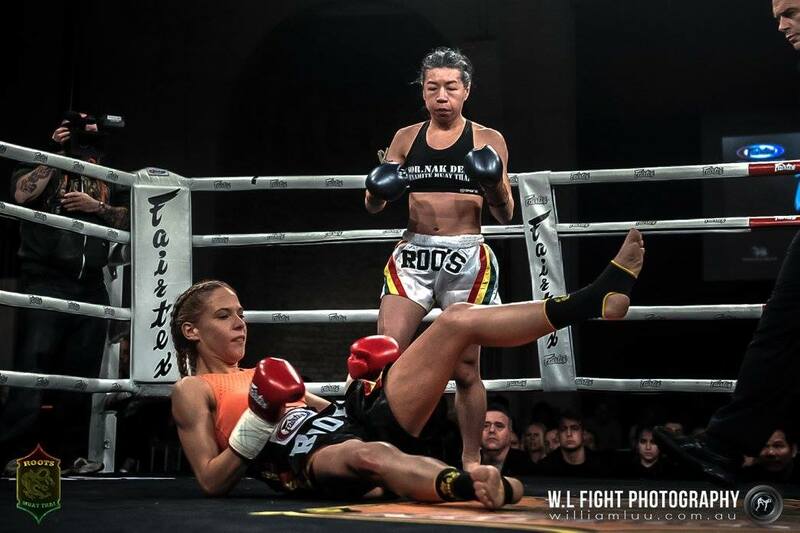 Dynamite Muay Thai Fighter Zia brought a tough fight back to Shenae concluding the fight with a majority win for team Sor. Nak Dee. 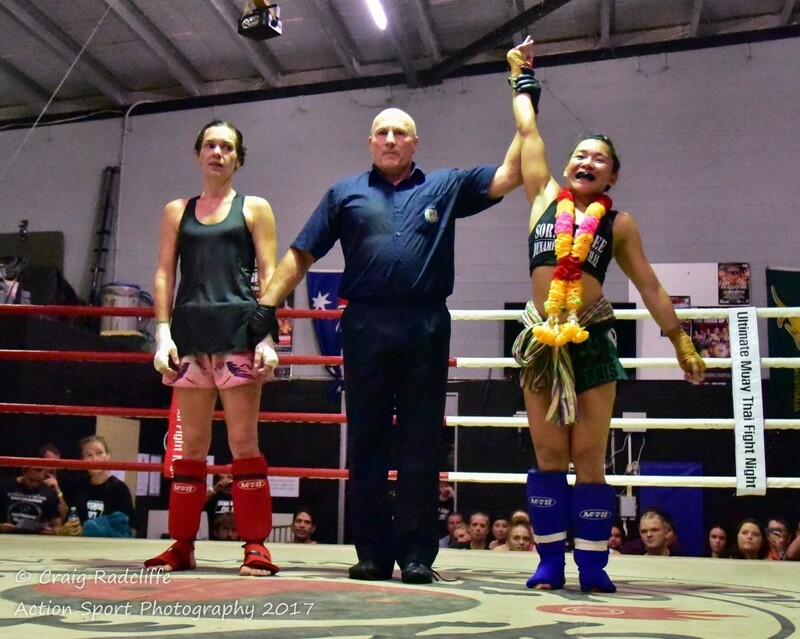 Congratulations to Perth Fighter Shenae and her team and an even bigger congratulations to Dynamite Muay Thai Fighter Zia taking the solid win for her fight family. Next fight for Dynamite Muaythai’s Sor. 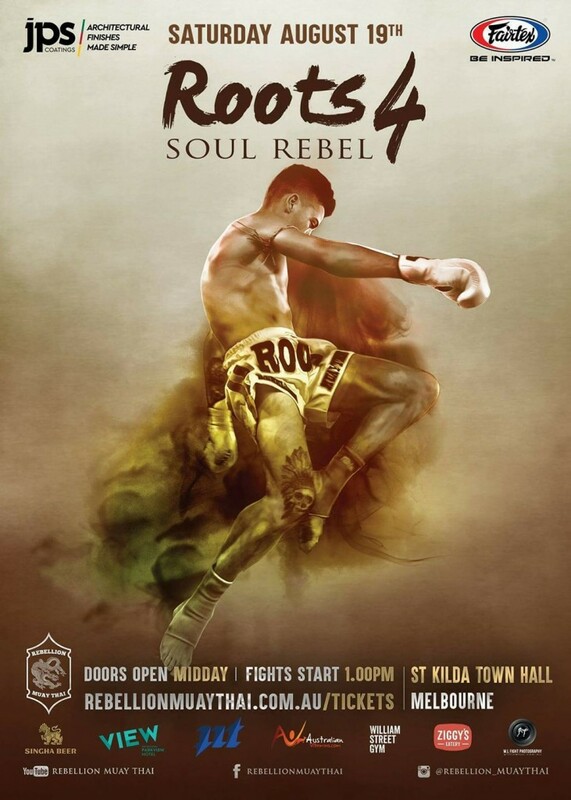 Nak Dee fight family is August 19 at the St Kilda town hall for Rebellion Roots 4 – Soul Rebel, with a stacked 13 bout card Dynamite’s Zia Seua Sor. Nak Dee makes her return to centre ring after a textbook unanimous win at Dynamite Muay Thai’s Dynamite Naksoo Muaythai Fight on the Female Fight Tour last month. 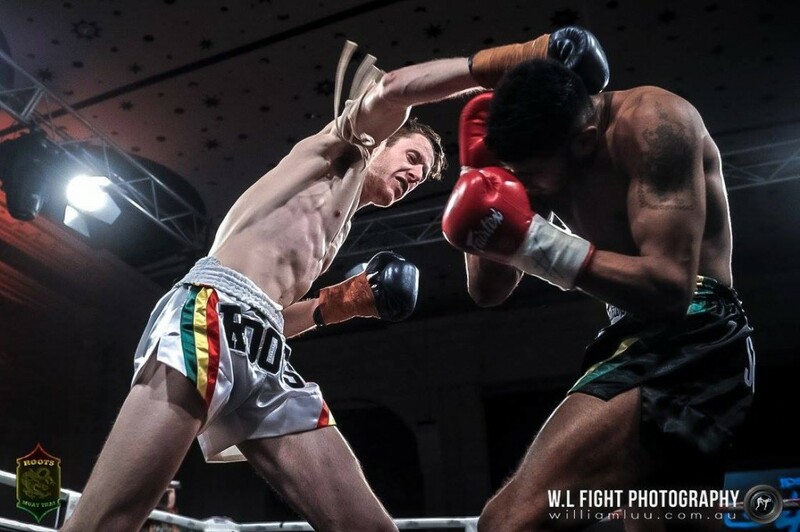 Zia will take on interstate opponent from one of Western Australia’s most reputable gym. Zia will be back in action making waves where she left off before her busy corporate work life took over. She is the favourite to win this fight but as per usual Dynamite Muay Thai’s Head Coach Kru Dennis isn’t about luck or chance he’ll be all about perfection and precision going into these fights. Next up for Melbourne CBD based Sor. Nak Dee fight family is Jimmy “The After Party” Sor. Nak Dee as Rebellion Roots 4 – Soul Rebel’s Main Event for the day time show. 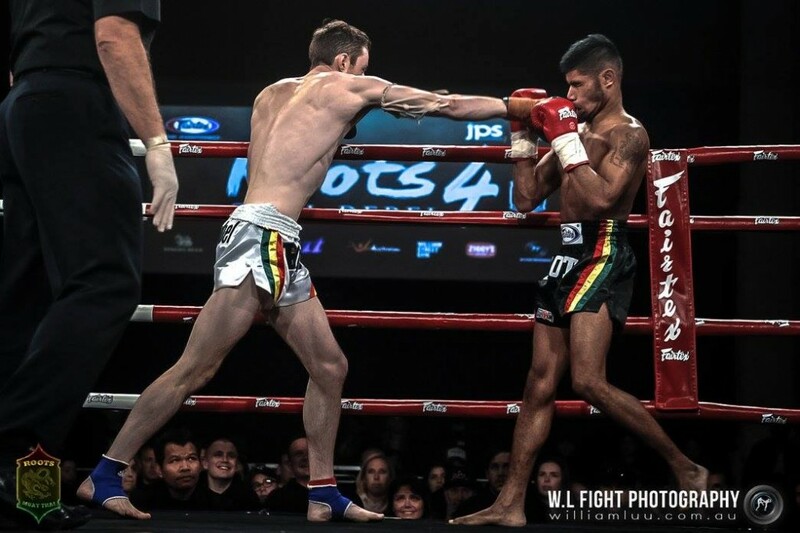 Just over 5 weeks to go until the next instalment of Dynamite Muay Thai’s Professional Muay Thai event to showcase not just to Australia but to the world, the heart and the grit it takes to be a professional Muay Thai fighter on the second instalment of Dynamite Naksoo Muaythai Fight. 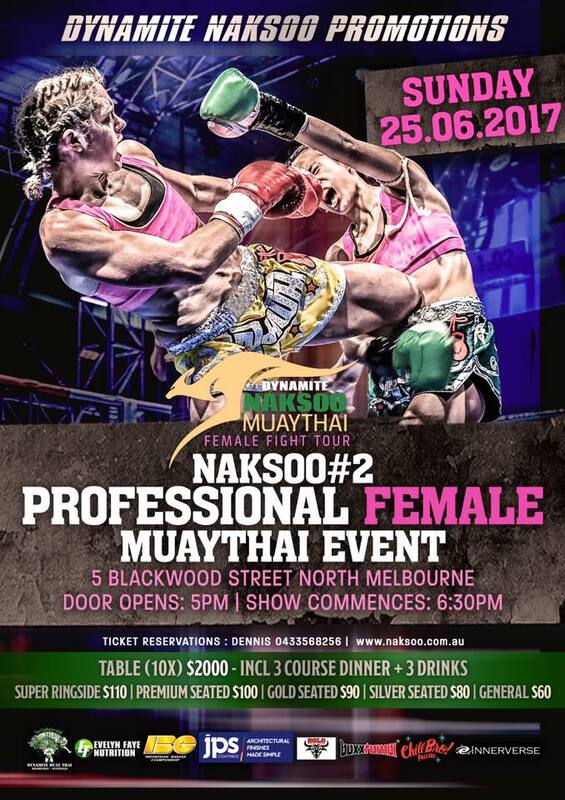 The fifth instalment of Dynamite Naksoo Muaythai Fight will be the second time on Australian soil and will be Australia’s answer to an all female fight card featuring fighters from coast to coast, Australia wide. 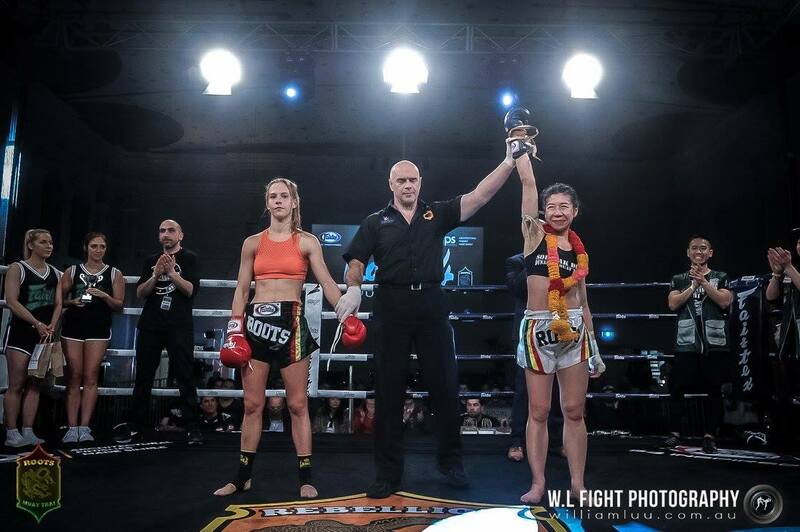 For more information or to register a female fighter please send fighter’s stats and records with all relevant information to dennis@dynamitemuaythai.com or private message to facebook page Dynamite Naksoo Muaythai Fight. Dynamite NAKSOO Muaythai Fight is BACK!! 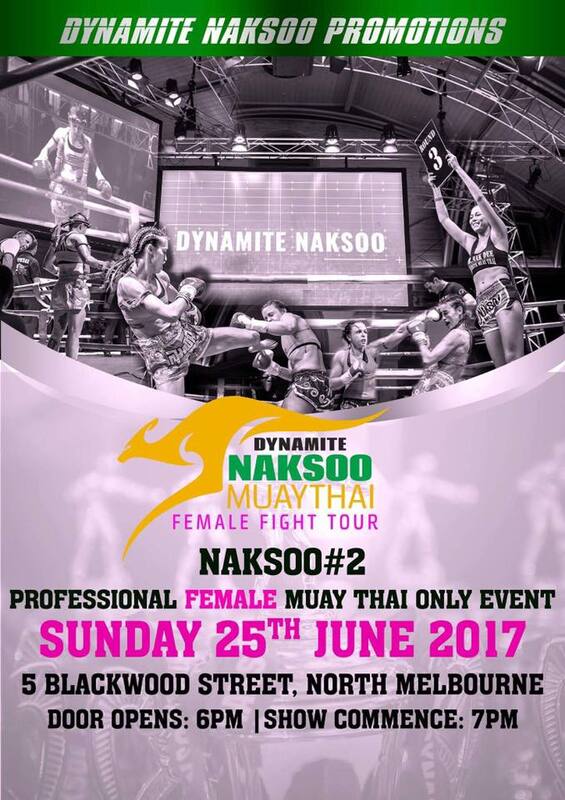 Australia’s premium 100% all female fight promotions Dynamite NAKSOO Muaythai Fight is back in Melbourne Sunday 25th of June 2017 with a huge national, international presence. 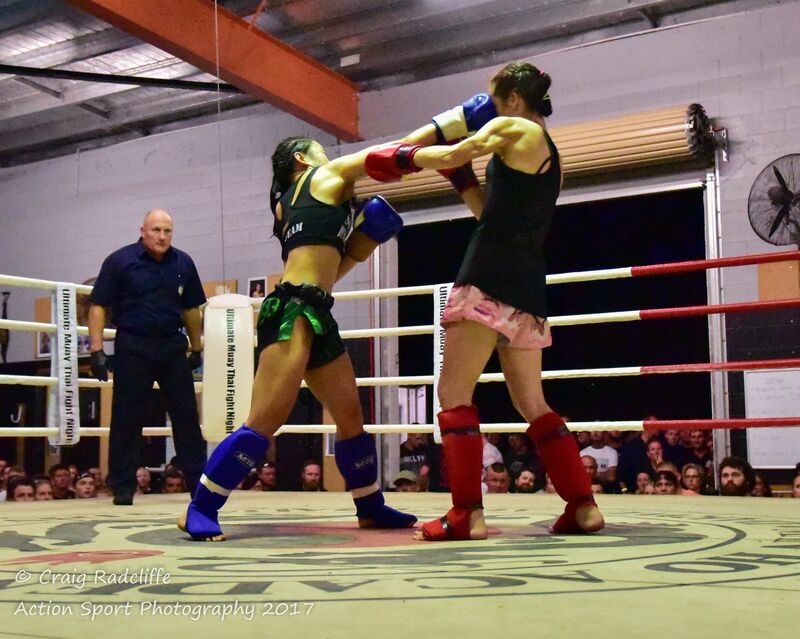 As the title suggests it will feature an ‘All Female’ fight card including a female headline main event fight with fighters from across the nation competing in a rising star female super 4 eliminator pitting state vs state and international fighters from around the world facing off against Australian local fighters. 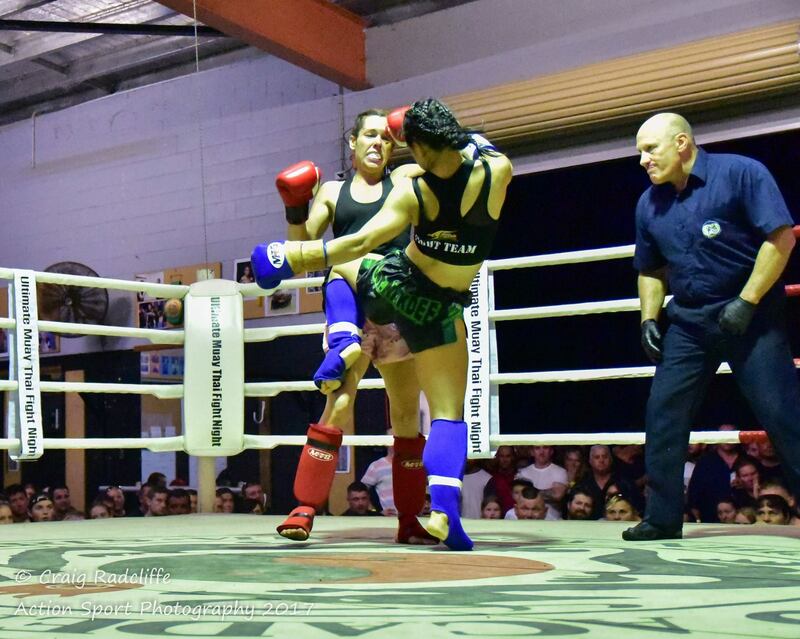 The event will be the second ever all female fight in Australia operated by Melbourne CBD based Dynamite NAKSOO Promotions with the event kicking off right here in the city at the iconic Victorian heritage Melbourne Meat Market building. 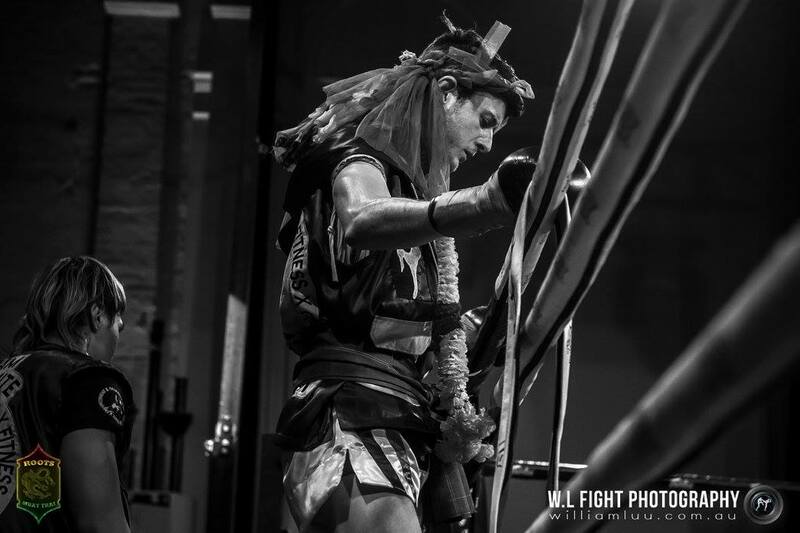 Dynamite Muay Thai fighter Jimmy “The After Party” Sor. 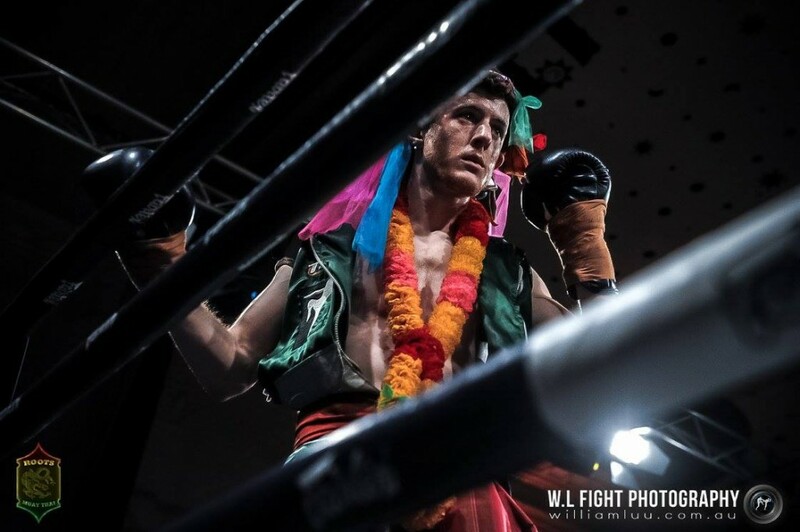 Nak Dee will make his return to Melbourne fight night Warriors Way 18 at the Doncaster Shoppingtown Hotel this Saturday night. 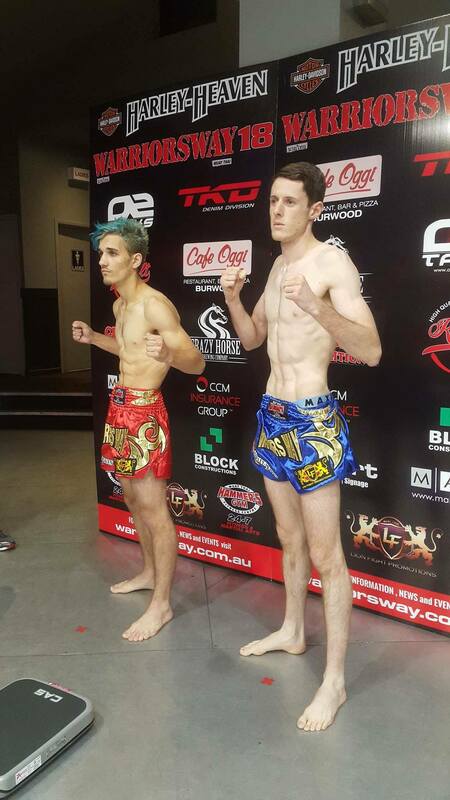 Dynamite Fighter Jimmy wearing the blue shorts will face off with his opponent at 62 kg in Full Thai Rules. Tickets at Dynamite Muay Thai are sold out, remaining tickets are subject to availability at the venue. What a way to finish off the busy fight weekend with Melbourne’s own Maria “The Philipina Phantom” Sor. 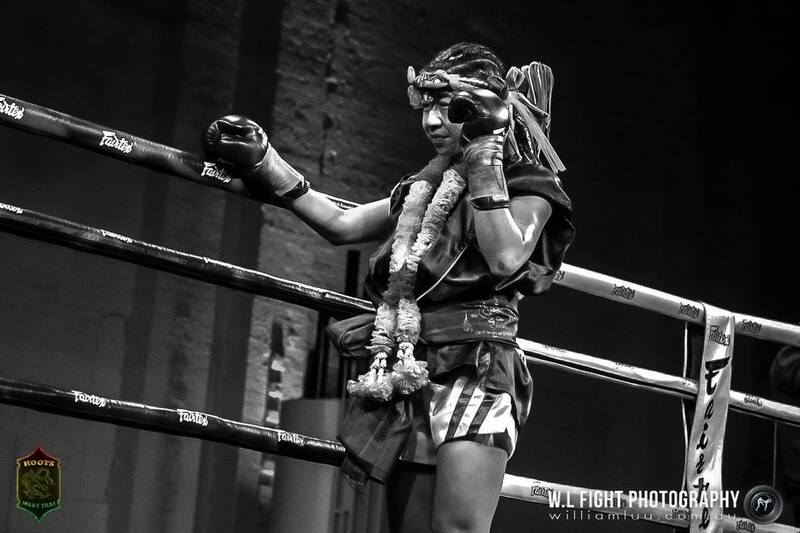 Nak Dee of Dynamite Muay Thai taking the TKO win early in the second round. Opening the Fury Rising Fight Night was one of two female fights featuring Maria Sor. Nak Dee coming in a foot and a half shorter than her opponent to say the least. The fight on the other hand was very Thai technique driven and saw both girls pulling off many big shots. With Maria landing 5 out of 6 of the jumping knees but losing in the clinch to her much taller opponent she was able to secure the win with her footwork and ability to adapt.